Multisite is a unique WordPress feature that allows you to run multiple WordPress sites within the same installation. Each site will be totally separate with unique content, users, and admins. WordPress multisite is mostly used by large magazines, newspapers, multi-national businesses, governments, educational institutions, etc. If you have always wanted to know how to create a multisite WordPress installation, you have come to the right place. In today’s post, I will cover everything you should know about setting up and managing a WordPress multisite network. How to Enable WordPress Multisite? You will be surprised to know that the multisite feature is provided with every WordPress installation. You just have to enable the feature to get started. That means you can create a multisite network on any of your existing WordPress sites. However, it is also possible to create a new site for the network. Save the file and upload it back to the folder. This was the first step in enabling the multisite network. The next step is to disable all the plugins on your site. Go to Plugins > Installed Plugins, select all the plugins, and deactivate them. Now, you are ready to configure the multisite. How to Configure the Multisite? Network Title: Here, you have to provide a title for your multisite network. Network Admin Email: This field is for the network admin email address. Click “Install” to move forward to the next step of the installation process. 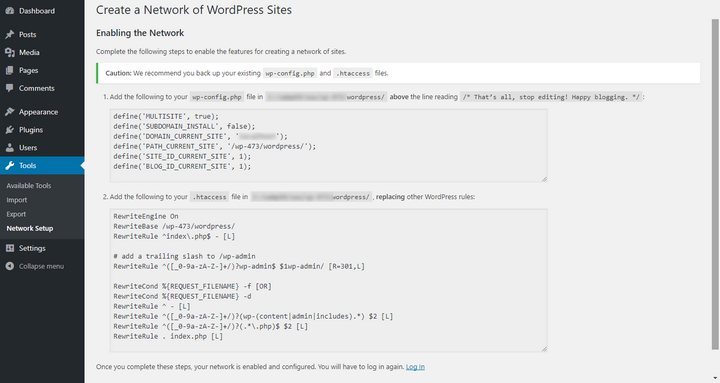 As you can see, the page provides you with some codes that you have to add to the wp-config.php and .htaccess files. Before you do this, I strongly recommended you to take a backup of both of these files. After having the backups, add the codes to the files by following the instructions. Then, get back to the dashboard. Now that you have enabled multisite, you have to log in again. Once you do that, you will find a new menu item titled “My Sites” on the top menu. That menu item confirms that you have successfully enabled WordPress multisite on your website. How to Manage the Multisite Settings? Navigate to My Sites > Network Admin > Dashboard to go to the admin dashboard of your network. This page will show the number of sites and users in your network along with the options to create a new site or a new user. As the page contains several sections, let’s tackle these one at a time. This section includes two options to change the network title and the admin email address. Here, you can manage the registration settings for your network. First of all, choose the appropriate new registration option. The other options will allow you to enable the registration notification email, allow site admins to add new users and separate fields to control which site names are allowed and which aren’t. This section enables you to manage various options for the new sites in your network. You will find separate fields to customize the welcome email, welcome user email, first post, page, first comment along with the author, email, and URL for the comment. In this section, you can define the maximum upload size per site, maximum file size, and the allowed file types users can upload. The language settings section hosts the option to set up the default language for your network. 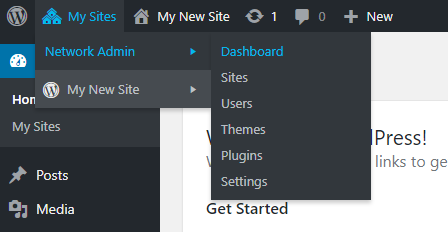 In the menu settings, you can choose to enable the plugins menu for the site admins. You can manage the network sites from the My Sites > Network Admin > Sites page. This will display a list of the sites in your network. Click the “Add New” button to add a new site. For each new site, you can define the site URL, title, language, and admin email. In the same way, you will find a list of the users in the My Sites > Network Admin > Users page. You can add a new user by using the “Add New” button. For each new user, you have to provide the username and email address. 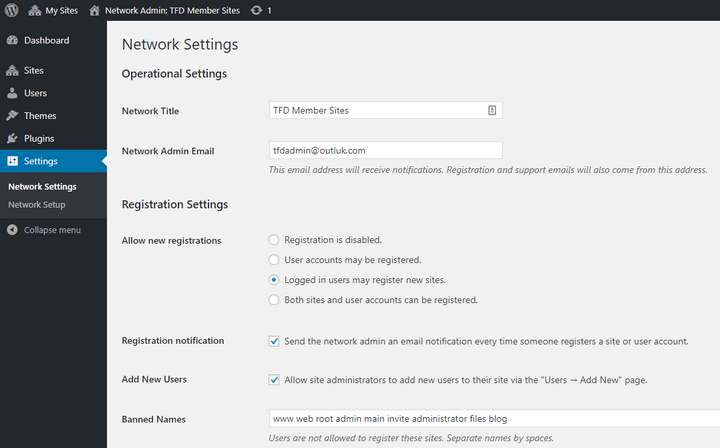 According to the default multisite settings, only the super admin can add a new theme or plugin to the network. Once you install a new theme or plugin, you have to enable it. You can do that by clicking “Network Activate” link. The site admins will have access to an item only after a network admin enables that item for the whole network. Creating a multisite could be an excellent way to manage several sites that are part of a large organization. Now that you have read this step-by-step tutorial, you should be able to create such a network easily. Let me know if you have any questions. I will try my best to clear your confusions.